Pacific Northwest Yacht Charter is an astonishing experience! The wilderness touches the soul, the beauty captivates the senses, the wildlife is magnificent, and the people you meet are delightful. The San Juan Islands, Vancouver Island, and the Broughton Archipelago are three regions popular with yachtsmen of the Pacific Northwest, but rarely featured as world-class destinations in charter brochures. They may be eclipsed by Alaska in the literature, but don’t let that dissuade you. Ask any one who’s been there, the adventure is phenomenal. Between mainland Washington and Vancouver Island, among the hundreds of islands rising from the still waters of the Salish Sea, are the 176 San Juan Islands. Shallow harbors offer safe harbor to shallow draft vessels, kayaks and tenders, and deep harbors provide perfect moorage for sailboats and larger yachts. Whether you whale watch from on deck, or kayak the Cascadia Marine Trail, or hike the evergreen clad Mount Constitution (almost exactly a half-mile high), the surround of shimmering waters, dense forests and rolling pastures is profoundly stirring. The San Juan Islands of the Pacific Northwest are famous for their resident pods of Orcas, Orca Whales, or Orca Orcinus. (Listen to live Orca songs here.) 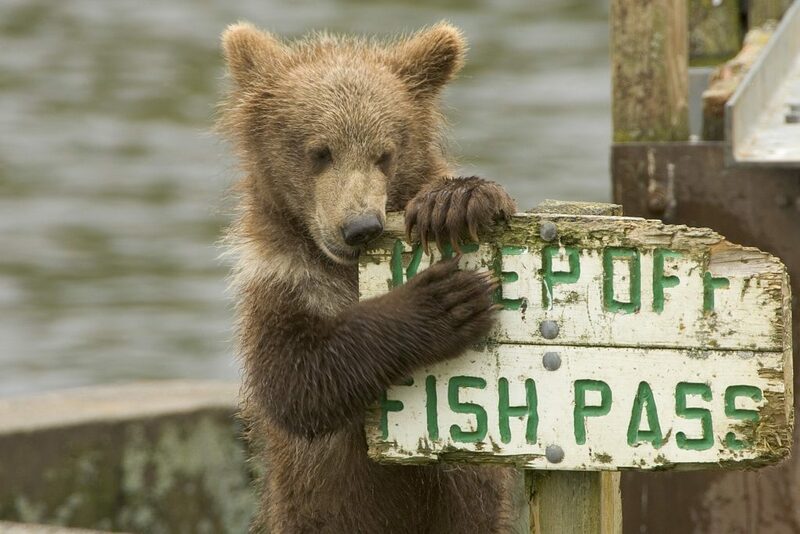 There are three resident pods that eat five different types of Pacific salmon: King, Sockeye, Silver, Pink, and Chum. Other marine mammals you will see include the Harbor seal, River otter, Steller sea lions, Common minke whales and Dall’s porpoise. On the four largest islands, San Juan, Orcas, Shaw and Lopez, boutique shops, gourmet restaurants, fine art galleries and proud museums beckon you ashore. Cruise to Friday Harbor for a dining experience to especially delight foodies and romantics. Duck Soup Inn is housed in a rustic cabin bedecked by twinkling lights. Sit in the glow of the flagstone fireplace, sip a glass of fine wine. Chef Kyle puts a sophisticated twist on comfort food using locally foraged ingredients. 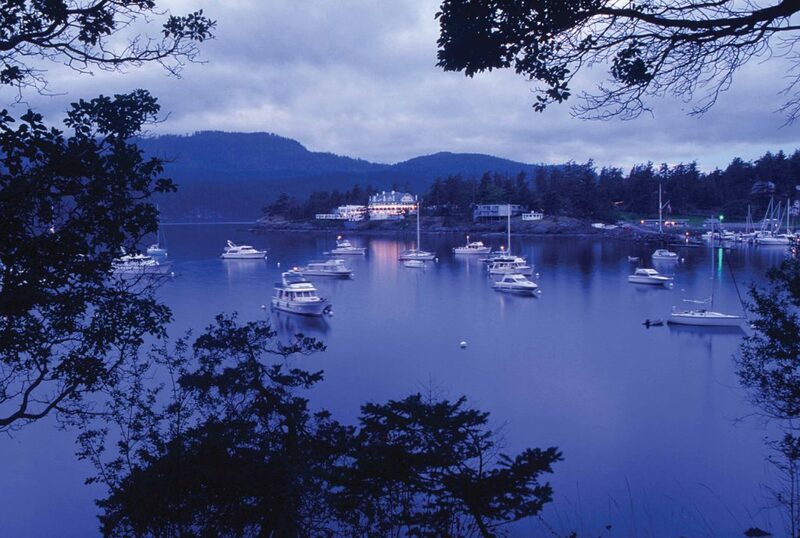 Head to Orcas Island to dock at the marina of the Rosario Resort & Spa. This architectural masterwork is a historic retreat designed for pampering, relaxing and rejuvenation. Victoria is historic, beautiful and inspiring. Dock in the Inner Harbor. Leave the fishing rods, kayaks and hiking boots aboard, bring your camera. Adopt a leisurely pace to stroll the capital city of British Columbia. Victoria’s British heritage is delightfully ubiquitous. Restored 19th century architecture, double-decker buses, horse-drawn carriages, fine museums and formal gardens make Victoria immediately beguiling. When in Victoria do as the Victorians, make a reservation for high tea. 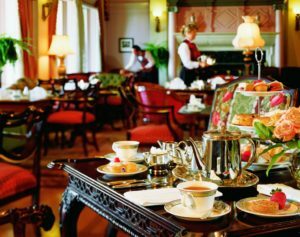 The Fairmont Empress Hotel serves 500,00 cups annually. In the media: Vancouver Island is rated the top island in the Continental US and Canada and one of the top ten in the world by the 2014 Travel+Leisure World’s Best Awards. National Geographic Magazine recognizes Vancouver Island as one of the best cold-water diving destinations in the world and the renowned Jacques Cousteau Society rates the area as only second to the Red Sea for diversity of marine life and water clarity. 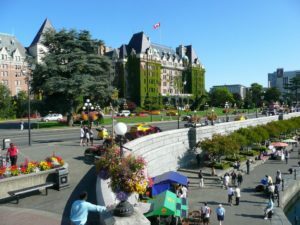 Victoria’s Inner Harbour is a great place to walk, admire the view, and look at boats of all descriptions. The city also has a challenging golf course and and miles of bicycle paths. Rent wheels and explore the Galloping Goose Regional Trail. Head 14 miles north to Butchart Gardens. Get lost along the paths of manicured flora in this fragrant wonderland. More than a century ago, Jennie Butchart began building what is now one of the world’s premier floral show gardens. Night life in the city sparkles. The city has world-class performing arts with live theatre, opera, dance, concerts, festivals and films. The thriving craft beer and cocktail scene is showcased in hotel bars, Old English-style pubs, micro brew pubs, bars and clubs. Plan at least one full day on your itinerary to discover Victoria. Embark from Port McNeil on a voyage through the Broughton Islands. The weave of waterways and island anchorages offer a diversity of sailing, sightseeing, kayaking, cultural heritage, and wildlife viewing. Venture about as far from urban reality as you can get. Float silently past deserted First Nations villages. 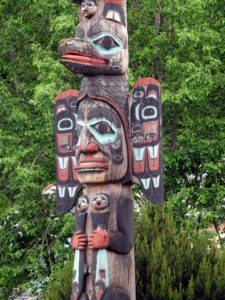 Photograph the skeletons of long houses and totem poles, vanishing into the Great Bear Rainforest. Tender ashore to dig for clams, pick oysters off rocks, or hike beneath fragrant cedar, pine and spruce trees. Poke about the curious seaside village of Sointula on Malcolm Island. Borrow a ‘green bike’ for a tour of shops, galleries, and a visit to the museum that documents a Finnish utopian dream. Scenic and sheltered, Echo Bay is a well known destination for yachters, sport fishers, and kayakers. Dock at Pierre’s Echo Bay Lodge and Marina on Gilford Island. 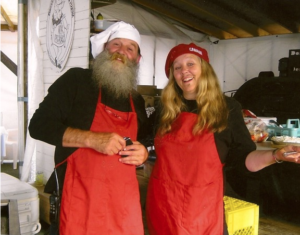 Greet yachtsmen at the marina and locals at the weekly pig roast. Pretty much any day you arrive, proprietors Pierre and Tove (right) have an event scheduled to entertain or enlighten or both. Food-based activities often take center stage. Be sure to hike the trail to meet Billy Proctor at his museum of oddities and treasures. 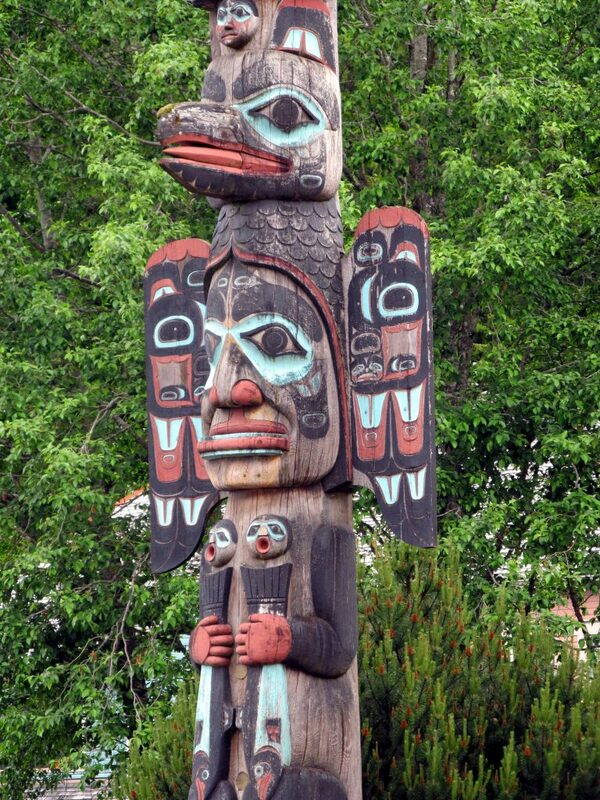 Alert Bay, once a thriving fishing center, still has a large native population and a fascinating native museum. While the views are spectacular from on deck, imagine an eagle’s eye view. From pretty much any port of call in the Pacific Northwest you can hire a seaplane, helicopter, or floatplane to view the world from a thrilling perspective. The Whale Museum, Friday Harbor, WA 98250, Tel: 800 946-7227 ext. 30, 360 378-4710. 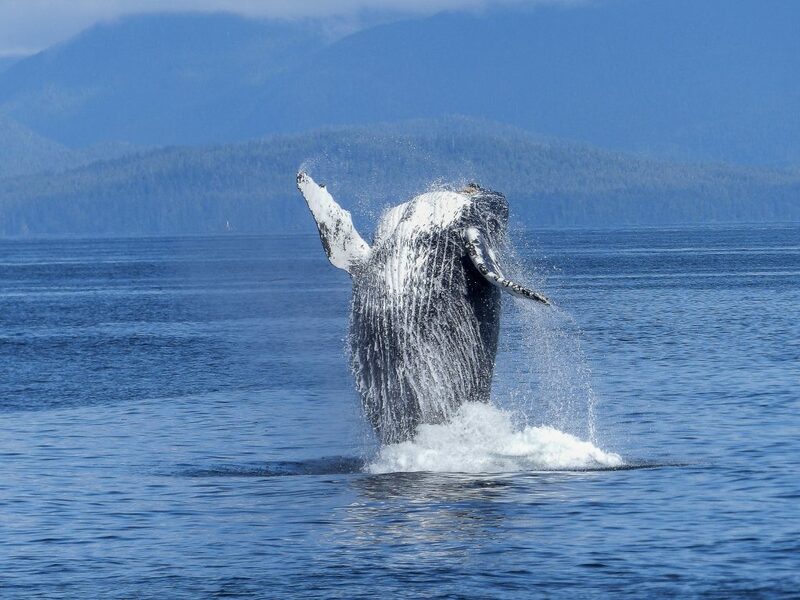 The Gallery of Whales is a great way for individuals, students and families to receive a personal introduction to the whales of the Pacific Northwest. Duck Soup Inn, 50 Duck Soup Lane, Friday Harbor, WA. Tel: 360 378-4878. Innovative recipes using locally sourced ingredients some of which can only be found in the region. With advance notice and a little pleading, Chef Kyle may be persuaded to host a private foraging/cooking class. Rosario Resort & Spa, 1400 Rosario Road, Eastsound, WA 98245. Seattle Shipbuilder Robert Moran built Rosario, from 1906-1909, with Arts and Crafts ideals in mind – time spent with family, a respect for nature and a return to hand craftsmanship lost in the industrial revolution. Dock at the marina, visit the museum, relax at the spa and enjoy first-class dining. Royal BC Museum, 675 Belleville Street, Victoria BC V8W 9W2. Tel: 250-356-7226. An educational adventure that is great for kids and adults. One of Canada’s greatest cultural repositories of natural and human history. The museum was founded in 1886; the Archives, in 1894. Olympic View Golf Club, aptly named for its beautiful views of Washington State’s Olympic Mountains, is located just 20 minutes outside of Victoria’s downtown core, on the southern tip of Vancouver Island. Pierre’s Echo Bay Lodge and Marina, Echo Bay, British Columbia, is a truly Broughton Archipelago must experience. Marina, restaurant, store, float plane, fishing charters, local characters. Nimmo Bay Wilderness Resort, 1978 Broughton Blvd, Port McNeill, BC, Canada. North America: 1 800 837-4354, International: 778 379-8882. Book a gourmet dinner, massage or hot tub by a waterfall. A perfect oasis of luxury amidst the lush west coast wilderness. Contact Select Yachts to charter the perfect yacht and build your Pacific Northwest itinerary. Trust us to organize your ultimate vacation. We’ve been there. We know the ropes.